Tropes regarding/relating to the Samurai. Bushido was the closest analogue to European chivalry, the code of the European Knights, but the Japanese code emphasized loyalty to one's lord, even to the point of doing evil, while the European one emphasized loyalty to one's conscience, even to the point of treachery. Compare Ninja Tropes and Sir Index of Tropes. Blind Obedience: Authoritative figures are followed without complain or question, because the idea alone of complaining about or questioning them is just blasphemy. Corporate Samurai: A samurai who works for a specific organization. Every Japanese Sword Is a Katana: All Japanese swords are katanas, even if they're not, because katanas are cooler. 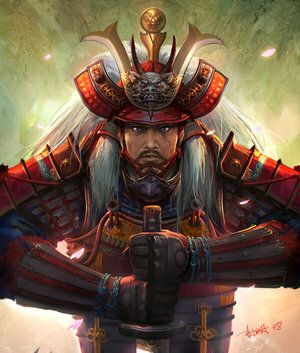 Everything's Better with Samurai: Even if it just doesn't make sense, there's a samurai in a work, because they're cool. Honor Before Reason: Doing what's "right", even if it's otherwise foolish and has dire consequences. Iaijutsu Practitioner: The (very cool) act of unsheathing your sword and attacking someone with it in the same movement. Japanese Spirit: The belief that everyone (or rather, everyone "good") is or can become better by a certain virtue, whether it's a born-with trait, a faith that cannot be shaken, or undying willpower. Katanas Are Just Better: A character wields a katana due to the underlying implication that katanas are simply cooler than any and all weapons. Kendo Team Captain: If a Japanese school has a Kendo team, then it must have a club president. And if the club president is shown, they will be important, and probably very, very skilled. Kid Samurai: Yeah, he's young and he hasn't really seen battle yet, but man if he doesn't have all the spirit of a real samurai. Knight in Shining Armor: Someone who fights the villains, protects the innocent, behaves honorably and fairly, and wields a sword or similar weapon, maybe on top of riding a horse and donning armor. Can be a literal knight or just similar enough to one. Lady of War: A woman who does not have to sacrifice her femininity or gracefulness to be a capable warrior. Naginatas Are Feminine: In Japanese works, nagitanas are always or almost always wielded by women. A possible addition to this is that katanas will be wielded by only male characters. Ronin: A samurai that does not have a master. Samurai Cowboy: The Wild West meets Feudal Japan and produces a capable fighter who wields both pistols and katanas. Samurai in Ninja Town: A single samurai vs a lot of ninjas. Usually one side is good and the other is evil. Samurai Ponytail: The standard samurai style is having long hair pulled up into a high ponytail. This either means they're noble, a samurai, or a noble samurai. Seppuku: The ancient Japanese rite of committing suicide via stabbing one's stomach, as a means of atonement. Street Samurai: A samurai with a more modern spin, but generally down-on-their-luck, scrappy, yet tech-savvy. Teenage Mutant Samurai Wombats: Heroic non-humans fighting crime in a modern setting, living in hiding from all of society save one or two human friends. This Is Unforgivable! : A character does something that is said in-universe to be unforgivable, and is treated as Serious Business, whatever it is. Warrior Poet: A character who is proof that you can be both a capable warrior and a cultured artisan at the same time. Western Samurai: Samurai that are only partially Japanese, or not at all. Wooden Katanas Are Even Better: Being able to use a steel katanas means you have to be skilled. Being able to use a wooden katana, and having it work? That means you have to be skilled.